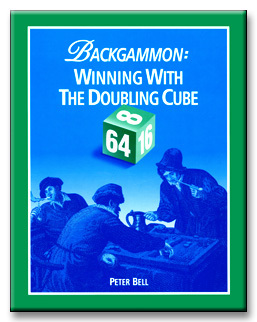 In 1995, Peter Bell posted a series of articles to rec.games.backgammon explaining the basic concepts of cube handling in backgammon. After many positive responses and encouragement of The Gammon Press's Bill Robertie, Bell turned the articles into a book. For more information about this book, see the author's own web page. "This book looks at doubling cube fundmentals: when to double (and when not to), how to evaluate winning chances in a position, when to take, and the psychology of doubling. Bell provides a number of benchmark positions for typical games types and goes on to describe how to change your play depending upon who owns the cube. He also looks at the difficult problem of evaluating blitzes, backgames and prime vs. prime positions by the use of formulae. "Chris Bray, in What Colour is the Wind? of cashers instead of market losers. I'm not sure how much work he has put into the tables of casher sequences and the win percentage needed to double. I don't use his tables, but I think it's the right way to think about the doubling decision. "The good aspects of the book are: (1) It is well structured and organized; things are explained clearly (even a bit repeatedly, but it does not matter). (2) It presents well the notion of take point, and value of cube ownership. Also, it explains very well how to determine when to double, what is the doubling point and the doubling plane, and when to play for the gammon and when not. "The theory of the doubling cube has lagged far behind checker play analysis, since it is a very difficult subject to get a firm grip on. Peter Bell makes an excellent effort to attack this thorny problem. He explains the mathematical concepts involved, and backs them up with many positions which are good illustrations. In particular, he attacks the problem of when to double with accurate and lucid explanations which far exceed anything which has previously been printed on this subject. COVER: Backgammon: Winning with the Doubling Cube is the first book from the Gammon Press devoted entirely to the proper use of the doubling cube. Players have long understood that mastery of the cube is the key difference between top pros and struggling amateurs. In this book, Peter Bell explains the secrets behind the doubling strategy of the masters. He shows how to evaluate positions, when to double, when to take or drop, and how to adjust your cube strategy to take advantage of your opponent's weaknesses. Winning with the Doubling Cube is a groundbreaking book that should be part of every player's library.